This section outlines the historical development of the land which now constitutes the lower Jim Mart Nature Reserve, and covers the period up to 2005. Input from any one who can provide more content, or correct what there is, will be warmly welcomed. Early editions of the Ordnance Survey 1:2500 series (approximately twenty-five inches to the mile) map show that the site became split between agriculture, presumably as an open field, and use for water storage and processing. This division of usage existed for at least 100 years, during which time the water works expanded in phases onto the west side of Press Brook. The Ordnance Survey 1:2500 map dating from around 1879-85 (see below) shows that the large field of the 1830’s had been split up to give the current separation between the land that is now the reserve, and the farm to the south, and a reservoir had been built on the east side of the brook. 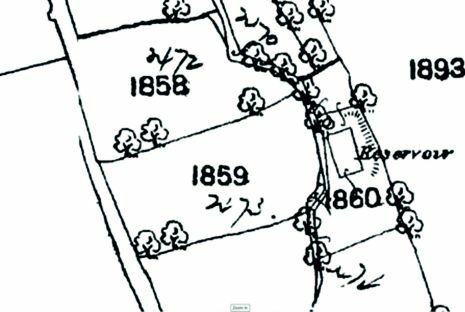 In addition, that part of the reserve lying to the west of the brook had been divided into two fields (numbered 1858 and 1859 on the map), with a roughly north-south split. By the time, circa 1898-9, of the next 1:2500 series map, the land on the west of the brook was still split in two (numbered 948 and 893 on the map below), but the split was now roughly east-west, and the current track down to the brook had been established. The reservoir is shown as split into two halves and a small building is shown (not extant). 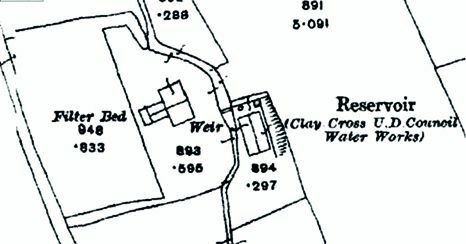 The reservoir is also captioned as Clay Cross W. W.. Records exist in Derbyshire Records Office relating to ‘Clay Cross Waterworks, involving proposed reservoir at Press Brook and acqueduct through Ashover and North Wingfield 1855’, although they have not yet been researched to see if they relate to the specific installation at the reserve. The 1917 1:2500 series map (see below) shows that the land on the west of the brook was still split roughly east-west, the section nearest the brook now had an arrangement of filter beds, and that the water works were operated by Clay Cross Urban District Council (formed around 1875). In the late 1930s the situation was unchanged, according to the Ordnance Survey 1:10580 map. 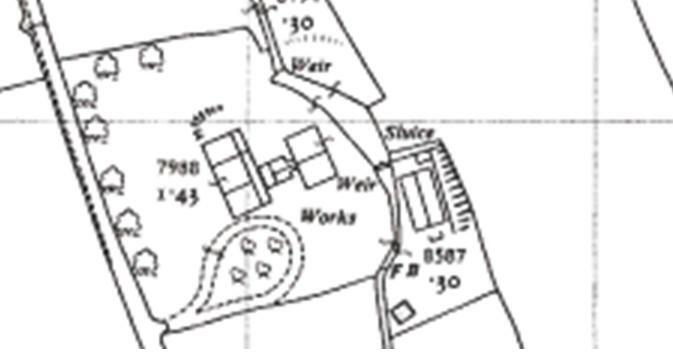 Subsequent expansion of the waterworks was recorded on the 1:2500 map from the early 1960s, with the disappearance of the division of the field west of the brook, additional infrastructure, realignment of the brook and a new, apparently landscaped, turning circle for vehicles. When the site later reverted to agricultural use the majority of the above-ground structures were demolished and some of the open storage / filter beds filled in. The main weir and the channelled sections of the brook. The Victorian period reservoir, now The Hide Pond. An underground storage facility (Not shown on the above maps). A small brick building, now the Hide. A larger brick building, now used for general storage and referred to as the Old Pumphouse, along with an adjacent concrete base (the Firepit). (The latter is not shown on the maps).